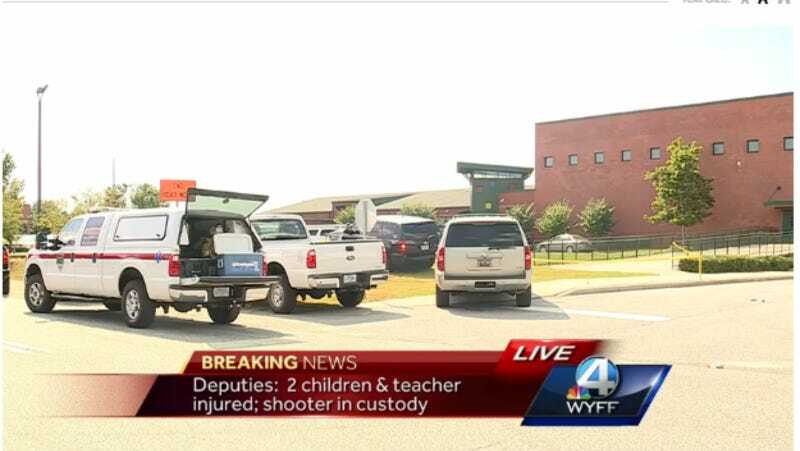 Reuters and local media outlets are reporting that at least two children have been shot during an incident at Townville Elementary School in Townville, South Carolina. The suspected shooter is reportedly in custody. As is always the case with every act of senseless gun violence in America, all we can do is hope it doesn’t get worse. The children were reportedly evacuated from the school by police and emergency workers and taken to a nearby church to await their parents. WYFF reports that the county coroner’s office is also heading to the scene of a death at a home about three miles from the school. Anderson County officials say the two incidents are related. The suspected shooter is reportedly a teenager. Two children and a teacher, a woman, were shot. Both children were life-flighted from the scene. The extent of their injuries are still not known. Greenville Online reports that the suspected shooter was a 14-year-old boy, and that the person found dead was his father. The dead man was identified by the coroner’s office as Jeffrey Osbourne, 47. Police said the boy was grabbed a veteran volunteer firefighter outside the school and never managed to get inside. The suspected shooter still hasn’t been identified and it’s unclear if he had any specific connection to the elementary school. Both children shot were little boys; one, who was shot in the foot, has been discharged from the hospital already. The other boy was hit in the leg and his current condition is unknown. The teacher was shot in the shoulder and has also been released.